Is there a way to snap to apparent intersections in ArcGIS 10.1+? Suppose there are two lines in an ArcMap 10.1 or 10.2 editing session that cross but do not intersect, per se. This is the case when new lines a drawn. Is there a way to snap to the point where the lines cross? AutoCAD has this ability, and calls these intersections apparent intersections. In the situation below, two new lines (Line 1 & Line 2) are drawn. In Example X, Line 2 was just created and topology has not been checked. The cursor is hollow because the create new feature tool is selected. In Example X, the snapping tip feature indicates there is no node to snap to at Point A. However, in Example Y, there is a point to snap to at Point A, because topology was checked in Example Y. So, short of checking for topology errors, there does not seem to be a way to snap to apparent intersections. Classic snapping is not enabled. The system here is running ArcGIS 10.2, with features in 10.1 SDE on Oracle. 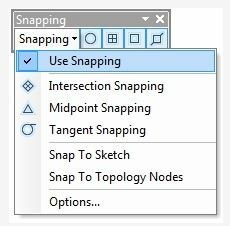 If you use the drop arrow on the snapping toolbar, you can select "intersection snapping". It will snap intersections even if there are no vertices. There may be a tool like that in the parcel fabric data model using parcel editing or an older parcel management add-in. This post outlines the differences between editing using fabric/coverage/COGO. 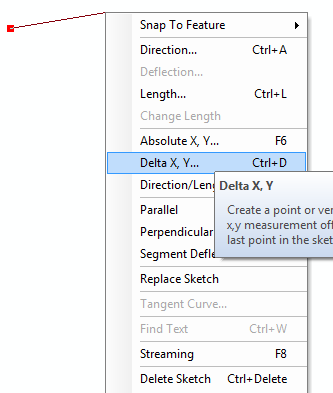 If you know it is perpendicular, or using the mid, or if you know the distance from measurement using the delta x,y segment deflection, parallel options. the snap to feature edge or mid. I can see you being able to step through some rarely used ArcGIS tools to get what you need. And finally (I have not used these tools) I found the Construction Guides addin that looks promising [except they haven't been updated since 10.0] :(. 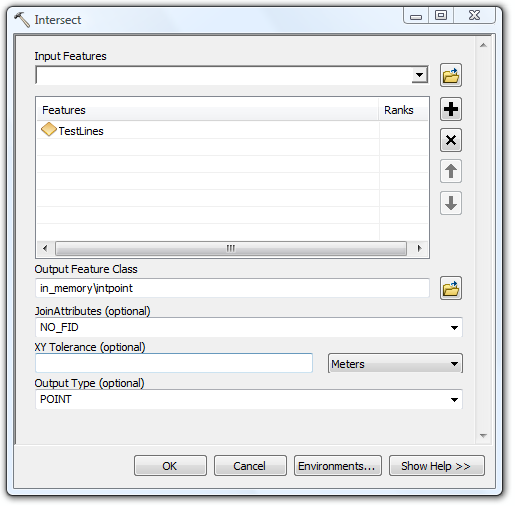 Run the Intersect tool on the layer with its selection sending the output to in_memory as a temporary place as shown below. Set snapping to POINT, turn off edge/vertex snapping. Remove temporary in_memory point layer. Try using the line intersect tool with the Advanced Editor toolbar. Not the answer you're looking for? Browse other questions tagged arcgis-desktop arcgis-10.1 arcgis-10.2 topology snapping or ask your own question. How tool to split polylines into two-part lines at vertices in ArcGIS for Desktop 10.1? Snapping “Point to Line” Results to Correct Streets in ArcGIS for Desktop? How to transpose data points to a line efficiently? Snapping leaves small gap between features in ArcGIS for Desktop? How to snap a road network to a hexagonal grid in QGIS? How to snap to intersection of lines with Classic snapping?